Are you looking for an antique designer Dressing Table? Look no further. Aarsun Woods offers to you traditional designs in wooden dressing table made from premium quality teak wood (sagwan) by experienced artisans. Wooden Dressing table with six drawer and one drawer with center area. The top center has stylish wooden mirror frame handcrafted in traditional floral and spiral carvings. The dressing table is supported by claw shaped designer legs. The overall look and finish makes you wonder of its origin. 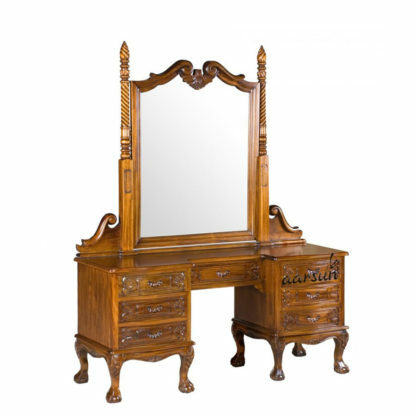 Wooden Dressing table will give an antique charm to your bedroom. 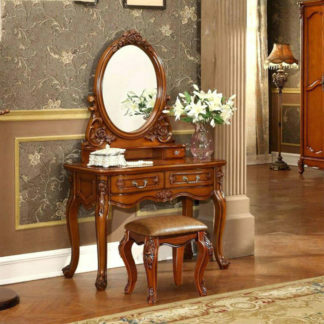 We excel in making wooden dressing table as per customer’s demand.